(WSFII) was a gathering of DIY infrastructure enthusiasts from around the world. WSFII marked the culmination of a series of meetings of Free Wireless Network communities that had sprung up in the wake of the deregulation of the 2.4Ghz citizen wifi spectrum in the 90s. Tinkerers, engineers, artists, community groups and activists had found new ways to use, interpret and deploy technologies on this newly opened bandwidth, and had begun to network internationally. WSFII reinforced the diffusion of this network into a broader ecosystem of complimentary approaches to the self-provision of communication, energy and societal infrastructures. The two-day summit included tracks on Free (as in speech) Money, Open Scientific Data, Free Networks, Free Hardware, Open Licensing, and Creative Commons. 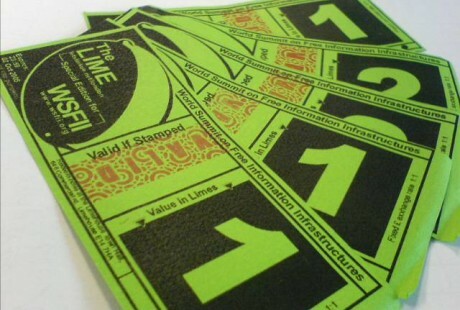 One of the most interesting infrastructures created and used at WSFII was ‘The Lime’ community currency. Peter Brownell designed and printed up this event currency especially for WSFII, which was accepted as legal tender in local shops, cafés, pubs and even in the local illicit bar. 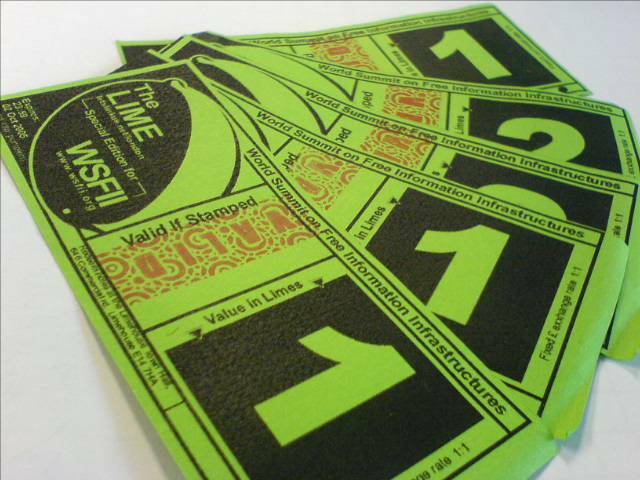 10% of whatever was spent in Limes during WSFII was kicked back to the bank, which funded the entire event. WSFII featured the first OKCon (the annual meeting of the Open Knowledge Foundation), and played host to the first BookSprint, Wireless Networking for Development. London Co-organisers: Jo Walsh, Rufus Pollock (OKFN) and Julian Priest (informal.org.uk / consume.net) and Peter Brownell. 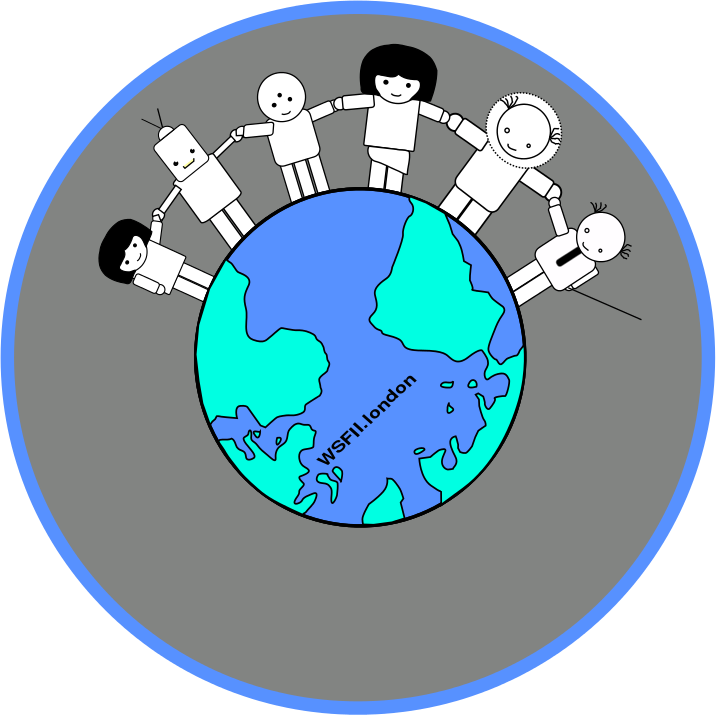 WSFII-worldwide coordinators including Shekhar Krishnan, Arun Mehta, Juergen Neumann and Cven from FreiFunk.net, Tomas Krag and Sebastian Buettrich from wire.less.dk, Sylvia Cadena, Bjarke Nielsen (Djurslands.net), Nagarjuna G, Gregers Petersen and many others. Limehouse Town Hall, which hosted the event. Tenyen, Ian Morrison and Andrew Wasilczuk who sorted out the networks.